Drivers, Passengers Say Uber App Doesn't Always Yield Best Routes People love Uber, but they often complain the Uber app's built-in navigation doesn't give its drivers the best directions. The company says the app helps drivers and passengers travel efficiently. Some Uber drivers and passengers complain that the app's built-in navigation doesn't give its drivers the best directions. There are many things Uber customers love about the service; confusion surrounding the navigation process is not one of them. Following complaints that Uber drivers didn't know the best routes to customers' destination, the company rolled out a new in-app navigation feature. It allows customers to plug in their destination before entering the car and provides turn-by-turn directions to drivers once the trip begins. But some passengers and drivers say Uber's navigation system is not providing the results the company promised. We asked NPR's Facebook followers why they use ride-sharing services like Uber. Customers say the service is convenient; the prices are low; the cars are generally clean; there's no need to call ahead or hail a car, as with traditional taxi cabs; the rating system keeps drivers accountable, and more. In short, people love Uber. 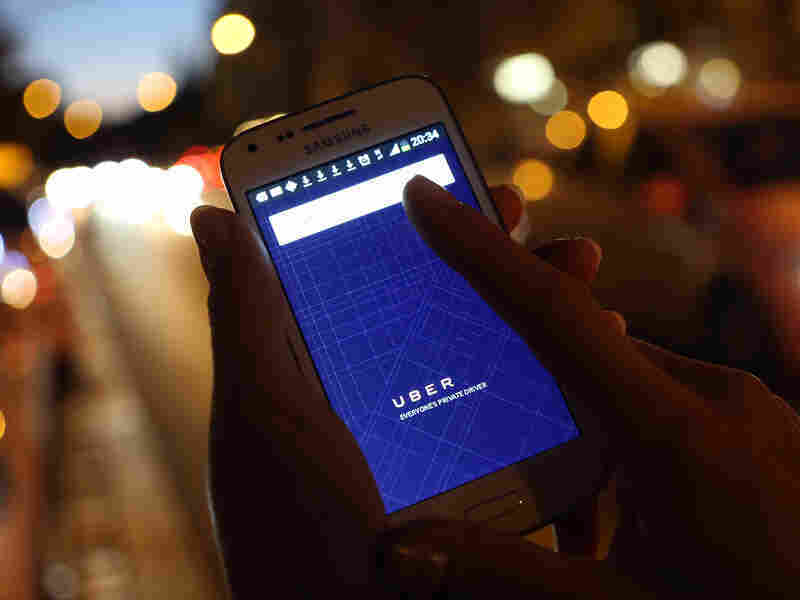 But navigation issues came up as a source of dissatisfaction even among those customers who sang Uber's praises. Laura Hardwick, a Washington, D.C., resident who uses Uber and other ride-sharing apps, says the benefits of these services come at a cost: UberX drivers tend to be less familiar with a city than their traditional taxicab counterparts. "A professional taxi driver has more time to get to know this city than 'citizen drivers' as I've dubbed the UberX drivers," Hardwick wrote in response to our call-out on Facebook. My only complaint with #Uber drivers is that they never seem to know where they’re going. Others users seem to agree. "Uber drivers in my experience usually do not have the same sense of the city that taxi drivers have. You may even end up needing to give the drivers directions," wrote Nicole Calvino from Allston, Mass. In fact, this is one of the reasons some prefer traditional taxis over Uber and other ride-sharing services. Jessica Burden, who wrote to us from Sacramento, Calif., says she regularly prefers Co-op Cab, a California-based taxi company, instead of ride-sharing services. "All of them are true cabbies," she wrote, referring to the company's drivers. "They know the best way to the destination, almost always remember me by name, and work tirelessly. ... They are real pros." Some Uber drivers say they can join the company easily and that the loose requirements and regulations translate to an unseasoned pool of drivers, at least in comparison to traditional taxi drivers. "The cab drivers know their zoning, they know their streets, they know their way," says Nono Girma, an UberX driver in the Washington, D.C., area. "It's something that they studied about and know about. ... They took a test for it and they got licensed for it. That's how they're driving. We're not licensed. ... We don't take a test." She says that although she grew up in Washington and knows the area well, she needs a navigation system to get customers from point A to point B. Instead of expecting drivers to use their own navigation system or rely on passengers for directions, Uber introduced its own built-in navigation system last month. According to the company's press release, Uber added the feature in order to "literally skip the step where you tell the driver where you're going" and eliminate the need to "juggle multiple apps or waste time typing in an address." In the same release, Uber also promises that the in-app navigation system, which provides turn-by-turn directions to drivers, will get passengers to their destination "via the best possible route." But according to some drivers, Uber is not living up to that standard. We asked Uber drivers on Facebook about their experiences and several of them complained about the company's app. @Uber_LDN takes an unnecessarily extra long route and says he cannot understand what im saying because of my accent! #racist much? I have a sneaking suspicion that the #uber app takes the longer route. "The Uber navigation is quite poor. It often suggests a bad route. [Passengers] don't want to be taken the long way. ... I find it unsatisfactory," wrote Corey Tunip, who says he drives for Uber in Torrance, Calif.
Uber provides its drivers with smartphones with the app already downloaded. If they want to use another system, drivers say, they have to use their own phone, and pay for their own data. Even with the new feature present, some drivers have turned to other navigation systems, including Google Maps and Waze, the Google-owned navigation system with live traffic information. "I wish it allowed us to choose our own navigation app. I'm a huge fan of Waze," Uber driver Macie Bain said on the Facebook group. Despite being dissatisfied with the app, some drivers say they feel they need to use it in order to avoid potential conflict with passengers. Zachary DeVine, an Uber driver in the San Francisco area, said that although the Uber app "isn't as good as Waze," he still uses it for navigation in case a customer is unhappy with the route at the end of the ride. If the passenger "doesn't like the GPS route, I can let Uber know that it's their problem not mine," he wrote. Some customers and drivers say the Uber app seems to take less-than-ideal routes. Josh Barron is a business administration student at Northeastern University who drives for Uber in Boston and surrounding suburbs during his spare time. He told NPR that he stopped relying on the Uber app for navigation after one particular incident, and has been relying on Waze and his TomTom GPS, instead. "I was giving this woman a ride and she said she was in a rush to go somewhere, so because she was in a rush I didn't take the time to put her address into Waze," Barron says. "I just left it right in the Uber navigation app and I noticed a little too late that it took me down a very traffic-oriented route. And not even the fastest route. It took me out of the way to go to Mass Ave ... one of the worst streets in Boston ... one of the slowest streets in all of Boston." A new feature in Uber's app allows customers to enter their destination when ordering a car, and provides turn-by-turn navigation on the driver's phone once the trip begins. Since then, Barron says he hasn't relied on Uber's navigation app, unless it's really late at night. And he says this was not an isolated incident. "It happens almost every ride. Uber's telling me to go one way but that's not the way I should be going. TomTom GPS knows, Waze knows it. It's pretty clear," says Barron, who grew up in a Boston suburb and is familiar enough with the area to know what streets and routes he should be avoiding. 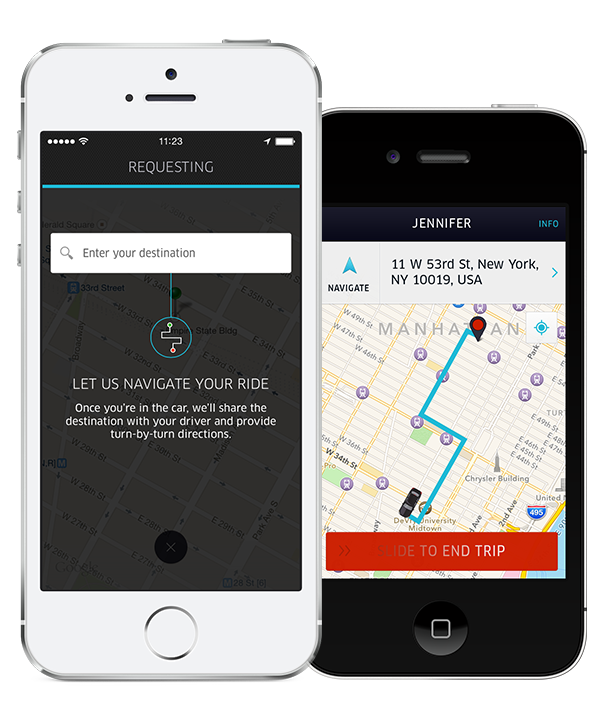 We asked Uber about drivers' and customers' complaints about the app's navigation. "There's no doubt that our in-app navigation feature has enhanced the Uber experience by enabling riders and drivers to more seamlessly and efficiently arrive at their destination," Uber spokesperson Kristin Carvell wrote in an e-mail. "That said, users always have the option to choose a different route." Uber didn't specifically respond to our question about how the navigation is routed — whether it is programmed to take the shortest time or distance. Although prices vary by location and fluctuate depending on demand, Uber charges a base fee as well as by the minute and the mile. In Washington, D.C., for example, UberX customers pay a $2 base fare as well as $0.25 per minute and $1.25 per mile.
.@Uber one of your drivers has made several detours from the original route. Drivers should have a better sense of navigation. UberX drivers get to keep 80 percent of the fare, while Uber pockets the remaining 20 percent (although the company has recently come under scrutiny for reportedly keeping more than it promised drivers). A transportation expert says the app is still in its early stages and that Uber may improve its navigation system in the future. "These are not trivial things to develop, and may have a lot of kinks [if not bugs] to straighten out. So is may be a simple 'work in progress' case," says Emilio Frazzoli, director of the Transportation@MIT initiative, adding that even established products like Google Maps, "while giving good recommendations most of the time, at times suggest routes through off-road trails, routes through heavy traffic, or long detours to avoid relatively light traffic." And while Uber may have some kinks to work out, Uber drivers are the ones likely to be affected if a customer is dissatisfied with a trip, as customers are asked their drivers after every trip. "The one time that I felt an Uber driver was taking me 'the long way' to make extra, I rated him 4 stars and left a comment stating that I felt that a shorter route could have been taken, and less than 24hrs later, I received an email from Uber thanking me for the comment and adjusting my fare to a lesser amount because they reviewed the route and agreed that a quicker one should have been taken," wrote Matt Rose in response to our Facebook call-out. A few bad ratings can end up costing a driver his or her job. "I know a lot of people that ... have been dropped by Uber. They can't drive no more because their rating is so bad," says Girma, adding that she hopes the perks that make customers love Uber extend to the drivers as well. "It's full of customer service with Uber. Which is good for the customers, right? They get treated better. ... Everything is good, but I hope it's gonna be fair for everybody."